Wednesdays trading session in cocoa pulled March futures down below 2100. At one point the market traded as low as 2095 testing key support levels. Cocoa futures closed down around 3.5% for the day, leaving the contract priced at 2109. The market saw follow-through following two down days to start the month. If the market breaks lower, look for 2060 to be tested. Demand in the soft is still in question as is production estimates. The dry season is currently happening in West Africa, which could affect output. El Nino is also heading that way which could also hurt production. As of now, these are what ifs. Globally, equities and commodities have had a rough week. With the shortened trading schedule on Wednesday, we will see what the markets do to end the week. If the equities continue to slide, look for commodities to possibly follow. 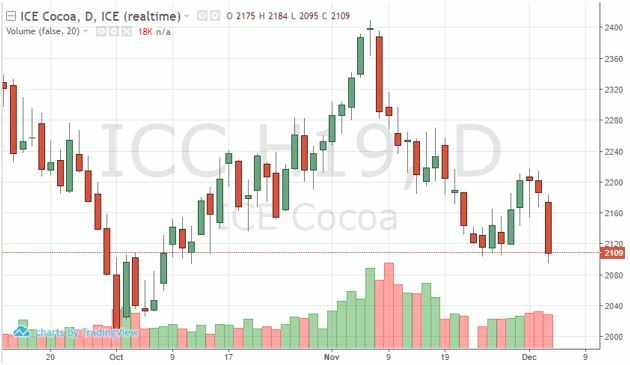 Heading into the final weeks of trading in 18, look for cocoa to recover from this weak few days. The fundamentals are still mainly bullish - poor production possibilities, end of year demand boost and a technical recovery after oversold levels are hit could lead to the March contract ending the year at 2400.